Redfish lures are our specialty here at Buggs Fishing. We love chasing redfish in shallow water and our redfish lures have proven deadly over the years. I often hear, “Heath, I tried everything else in my tackle box and they wouldn’t eat anything I threw at them. Then I tied on a Bugg and they crushed it!” It’s music to my ears, and I’ve heard it often. We’re going to talk a little bit about design, and then spend most of our time going through the different redfish lures we offer and how best to use them. There are three main reasons our redfish lures work so well. First, they land softly and ride hook point up. Redfish love shallow water, but they have to be on guard from predators and can spook easily. The jig heads on our lures are flat on the bottom and make less of a splash when you cast them. They also land hook point up and will rest on the bottom without tipping over. Riding hook point up will reduce snags when you’re swimming them. And if you’re fishing over a muddy or sandy bottom and can let them sink to the bottom and sit there…Well that brings us to reason number two. The second reason our redfish lures work so well is that they look alive in the water. They’re all tied with rabbit strips, and nothing moves in the water like rabbit. Redfish cruise the shallows looking for baitfish, shrimp, and crabs. When you can put a lure in front of them that looks alive, whether swimming or at rest, you’ll increase your chances of getting a bite! The third reason our redfish lures work so well is that they imitate what redfish like to eat. Our inspiration comes from the best ideas from the fly fishing world. When you’re fly fishing and it comes time to choose a fly you ask yourself, “What are the fish feeding on?” And then you try and “match the hatch”. We’ve transferred these same ideas to lure fishermen with our Redfish Buggs. Some of them closely imitate a certain type of bait, and some give the general impression of several different kinds. These are the main reasons our redfish lures work so well. Now we’ll talk about the three redfish lures we’ve developed. And then we’ll talk about other Buggs that work for redfish and when and how you might use them. There are three models of redfish lures. They were designed specifically for redfish, and they’re available in three sizes: 1/8 oz., ¼ oz., and 3/8 oz. These are the weights of the jig heads they’re tied on, so they’ll all weigh a little bit more when you fish them. They’re all tied on the Buggs Redfish Jig Heads, and feature a super strong and super sharp jig hook with a flat eye. They’re all tied with a double weed guard, and all ride hook point up. Idea: Saltwater “Attractor Pattern”, meaning it imitates lots of different things. Our best selling redfish lure. Also our most versatile, it can be fished three different ways. When To Throw It: Most effective as a search bait in shallow water. Blind cast in skinny water whenever you think there might be redfish around. Also works well in sight casting situations. Lots of action when you swim it or at rest. How To Work It: When blind casting, reel it in fast enough to keep it off the bottom, giving it some jigging action along the way. Redfish will absolutely crush this jig. When sight casting you can swim it in front of a cruising fish, or lead the fish and let it settle to the bottom. When the fish gets close, scoot it a little and then hold on. 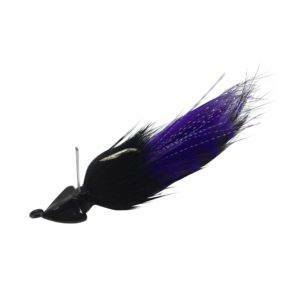 Construction and Rigging: Curl-Tail Buggs are tied with a magnum rabbit strip on top and zonker rabbit strips on the sides. The top strip has a slit cut in it so it will easily slip on and off the hook. This is how you change out the grub. Comes rigged with a 3” grub tail. A custom screw-lock holds the grub in place. Tails easily replaced when they get torn up. Can also be fished without the grub for a shorter profile, and lots of customers change out the standard grub and install a GULP product. Popular Colors: Three of the most popular colors are seen below, starting from the left: Blue Crab, Black Gold, and Electric Chicken. 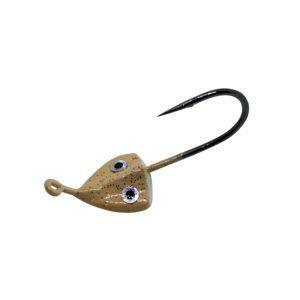 Other uses: Flounder fishermen love this Bugg for it’s versatility and effectiveness. Speckled trout in shallow water will eat it as well. In freshwater, all species of bass have eaten it. Random Awesome Story #1: A customer was in Belize and was casting to 80-100 pound tarpon, trying lots of different lures, but they wouldn’t eat anything. 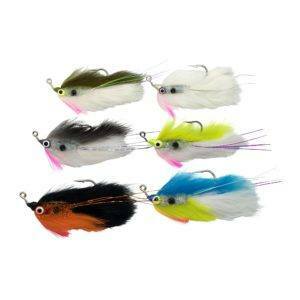 He opened his tackle box and his guide told him to try the Hot Pink Curl-Tail Bugg. BOOM! Random Awesome Story #2: A customer was sight fishing bedded bass on Lake Austin. He chose the Hot Pink Curl-Tail Bugg because it was the easiest for him to see. Added a white double-tail grub trailer and caught an 8 pound bass! Idea: Shrimp imitation with a simple, clean design. When to Throw It: When reds are chasing shrimp, whether in shallow or in deeper water, throw this Bugg. Works well sight casting or blind casting. How To Work It: In shallow water, let it settle to the bottom over mud or sand and skim it along. Over grass, reel it in fast enough to keep it from snagging and giving it jigging action along the way. In deeper water, let it sink near the bottom before bringing it in. Twitching it on the retrieve helps. Experiment with the severity of the twitches. Construction and Rigging: Ready to fish right out the package, so no rigging required. Tied with a magnum rabbit strip on top and a magnum rabbit strip on the bottom. They’re glued together to maintain the profile in the water. Three of the most popular colors are seen below, starting from the left: White Stripe, Natural, and Gotcha. Other uses: When birds are working over shrimp in open water this is a great option for trout and other fish that are chasing them. The 3/8 oz. works best for this. Just like the Curl-Tail, flounder really like this Bugg. Random Awesome Story #1: Buggs friend and light tackle/fly fishing guide Scott Null once caught 57 redfish on a Double Bunny, before lunch one day. Bait was being sucked through a drain in the fall and he set up at a particularly good spot and caught them. Random Awesome Story #2: My Dad was fishing a farm pond in Texas and heard a bass bust something in the shallows among some lily pads. He cast a black Double Bunny up there and caught an 8 pound bass! Idea: Realistic imitation of a redfish’s favorite food, the crab Sits on the bottom and looks alive! When to Throw It: Ideal for sight casting to tailing and cruising redfish. How to Work It: Cast it to tailing or cruising redfish and let it settle to the bottom. If they don’t inhale it immediately, and they almost always will, scoot it ever so slightly along the bottom. This will kick up a little puff of sand or mud and drive them crazy! Construction and Rigging: Ready to fish out of the package, no rigging necessary. Tied to look like a crab, with claws at the back and rubber legs near the head. Palmered rabbit in the middle and a touch of flash at the mouth gives the Beastie Bugg the most movement of any of the redfish lures. Three of the most popular colors are seen below, starting from the left: Blue Crab, Backcountry, and New Penny. Other uses: Besides redfish, other fish that eat crabs will eat Beastie Buggs, and they’re a popular option with our customers who are headed on a bonefish trip and might encounter bigger reef fish and inshore fish. Bass will eat Beastie Buggs as well, and I believe they think it’s a crawfish. Random Awesome Story #1: The first report of a tarpon on a Bugg came from a friend who sight casted a 20 pounder in Belize. This was a prototype I hand tied for him in the Gotcha color, and I was some kind of excited! Random Awesome Story #2: Buggs friend and kayak fishing guide Dee Kaminski from Florida sight casted huge speckled trout on the PBT color in the winter. She is careful to release her fish unharmed and didn’t measure it, but judging by the picture it was north of 25 inches. Now we’re going to talk about other Buggs that work well for redfish. One of the great things about fishing is how unpredictable it can be. Read on to learn how pleasantly surprised we are about these other Buggs and their effectiveness as redfish lures. 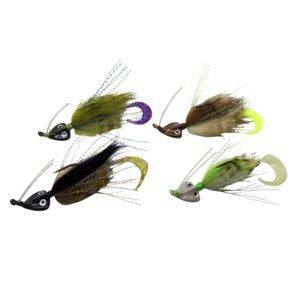 These are multi-species swim jigs that were developed for deeper water and have a bigger profile than Redfish Buggs. But I soon learned that in certain situations these lures would outperform everything else! They’re most effective in deeper guts, dirty water, low light conditions, and when fish are keying in on larger bait like mullet. 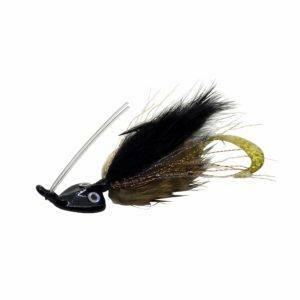 In dirty water, from 6” to 6 feet, this Bugg will draw fish in with the larger profile and double rattles. They sink more quickly than Redfish Buggs, so in deeper guts and in swifter current use a Hydra Bugg to get down to them. Let it sink and twitch it up off the bottom, reeling a little at a time, working the water column and engaging the rattles. A straight retrieve works sometimes, but I like to give it a little action. Tied on a ¼ oz. jig head, additional weight with the rattles, tail, and materials. Rig with 4” grub tail or your favorite 4-5” soft plastic. Three of the most popular colors are seen below, starting from the left: Electric Chicken, Chained Beast, and Texas Tea. These imitate shad, a baitfish found in saltwater environments from the Carolinas to Texas. They also imitate a menhaden, another baitfish that redfish feed on. 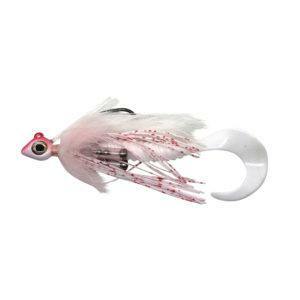 Ratic Shad Buggs are the first tied jigs that darts back and forth on the retrieve. In another match the hatch type scenario, throw these redfish lures when you see them chasing baitfish near the surface. 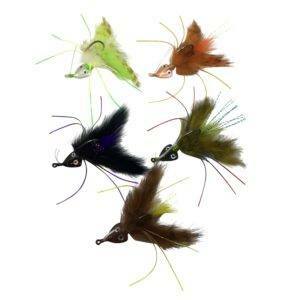 Cast them and begin working them like a topwater, with short twitches. This will give them a walk-the-dog type action. On the pause they’ll sink slowly and upright, with lots of action from the rabbit. The smaller 2.5” size works great when they’re chasing smaller baitfish and when sight casting. Throw the larger 3” size when blind casting. Wait, I thought we were talking about redfish lures? Well, the more I learned about redfish and bonefish the more I’m convinced that they’re related somehow. They both cruise the shallows in search of baitfish, shrimp, and crabs. They both have inferior mouths, meaning their mouths are on the underside of their heads so it’s easier for them to eat off the bottom. And they both fight like heck when they’re hooked! I talked about matching the hatch at the beginning of this article. Well, there are times when redfish are eating small bait. And there are times when they’re spookier than normal. At these times having smaller profiled lures could mean the difference between a limit and a skunk! 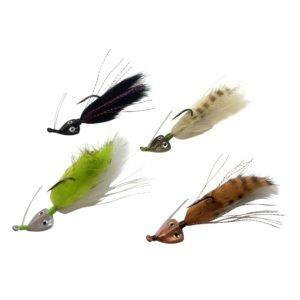 There are five types of Bonefish Buggs. Although designed for specifially for bonefish, redfish eat bait this size. 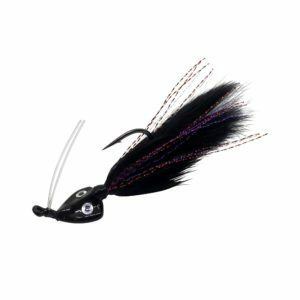 And these jigs are heavy enough to cast on redfish tackle and the hooks are strong enough for big fish They’re available in two sizes: 1/16 oz., 3/16 oz. They’re all tied on the Buggs Bonefish Jig Heads, and feature a strong, sharp hook that is slightly smaller than the Redfish Jig Heads. They’re all tied with a single-post weed guard, and all ride hook point up. 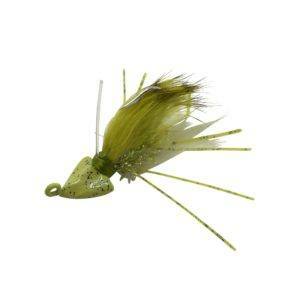 Hot Head Buggs – realistic shrimp imitation and our best-selling Bonefish Bugg. When redfish are chasing small shrimp, throw this Bugg! Three of the most popular colors are seen below, starting from the left: Natural, White Stripe, and New Penny. 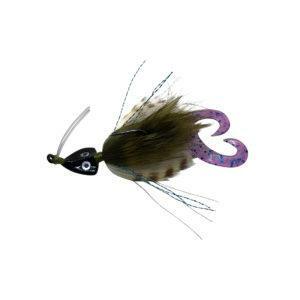 Loco Buggs – inspired by the Crazy Charlie fly, this Bugg gives the impression of a shrimp or small baitfish. Throw in the same situations you would a Hot Head Bugg – when the redfish are chasing shrimp! Swim it or scoot it along the bottom. Three of the most popular colors are seen below, starting from the left: Gotcha, Key Lime, and Ghost. 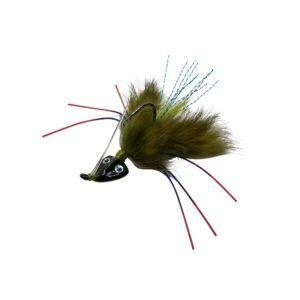 Bitty Buggs – inspired by the Bonefish Bitters fly, this is a small crab imitation. Let it settle to the bottom and give it short twitches or scoots. When the redfish gets really close, let it sit there and look alive! Three of the most popular colors are seen below, starting from the left: Blue Crab, Night’s Watch, and Turtle. 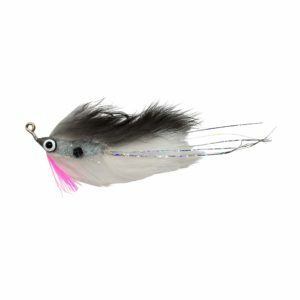 Slider Buggs – inspired by Borski’s Bonefish Slider, this imitates a small baitfish. Lots of action just sitting on the bottom, or scooted along. Three of the most popular colors are seen below, starting from the left: Backcountry, New Penny, and Natural. 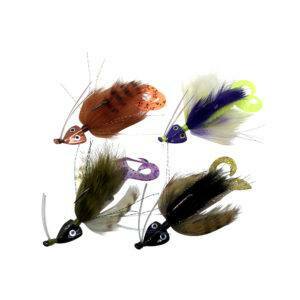 Flats Buggs – inspired by the Curl-Tail Bugg, featuring a 2” grub on the back. Super effective attractor pattern for shallow water. Blind cast or sight cast when the redfish are chasing small bait, when they’re really spooky, or they’re in thick grass. Quickly becoming the most popular lure for redfish from the bonefish collection. Three of the most popular colors are seen below, starting from the left: Blue Crab, Black Gold, and Electric Chicken. From the beginning our best customers have been anglers who target redfish in shallow water. I hope you enjoyed learning about the different redfish lures we offer and will give Redfish Buggs a shot the next time you’re out fishing. We offer lots of different kits and combinations in the online store, and would be happy to talk with you about what might work best.